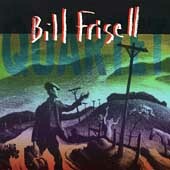 Bill Frisell Quartet 1 Tales from the Far Side 6:27 2 Twenty Years 2:55 3 Stand Up, Sit Down 5:37 4 Convict 13 5:36 5 In Deep 3:10 6 Egg Radio 4:31 7 The Bacon Bunch 4:26 8 Prelude 1:36 9 Bob's Monsters 8:44 10 The Gallows 6:14 11 What? 3:26 12 Dead Ranch 4:27 13 Coffaro's Theme 4:27 All compositions by Bill Frisell except "Prelude" by Bill Frisell and Ron Miles "Bob's Monsters" and "In Deep" borrow a lot from "Deep in the Heart of Texas"
At first the lineup for this album looks a little bit confusing. Not only is the guitar/trumpet/violin/trombone setup unusual, the musicians are from wildly diverse musical backgrounds. Colorado based Ron Miles composes jazz along the lines of 60's Ornette Coleman and electric Miles Davis with hard rock guitars and hard hitting bass lines. Curtis Fowkles is the trombonist for John Lurie's Lounge Lizards, the tongue in cheek "fake jazz" group that came out of the No Wave scene of early 1980's New York City.. Eyvind Kang works in fringe experimental music, dabbling in everything from pure feedback to aggressive improvised power rock. However, with a singularly unique vision, Frisell has fused these three people into one of the most incredible ensembles I have ever heard. Without a drummer or a bassist, this group is given a lot of space to move around. The music Frisell has written for this group is exquisite; simple tone poems that float in space. These four musicians seem to have the sound of an orchestra rather than a jazz group. There are very few solos, mostly just instruments filling in space with occasional variations. This album fuses classical, jazz, rock and country seamlessly, all swirling them into a bed of sound, a wash of colors and emotions. The results are closer to poetry than music, a reminscence on American music that speaks of lonely towns, lost thoughts and lying awake in bed at night. This album marked a new phase in Frisell's recording career. With Quartet Frisell's music took on a more rich and relaxed tone, one where simple melodies where augmented by layers of sound. He has gone on to explore this further in Nashville, Gone, Just Like A Train, and Good Dog, Happy Man. There really is no way to describe this album, which is utterly unique in its vision and execution, and unlike anything else Frisell has done before or since. Highly recommended to anyone with an ear for beautiful and unusual music.